This dish used to be on any chinese restaurant's menu of yesteryears and i wonder if it is still as popular. 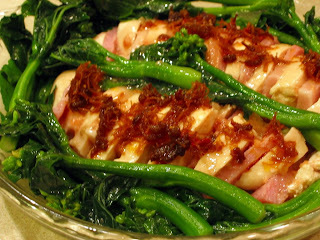 It is one of my favorite dish to prepare - the saltiness of the ham enhances the smooth velvety chicken, and the luscious green , crunchy kai lan gives a touch of sweetness. I garnished with a couple of spoonfuls of XO Sauce - homemade of course. This dish is easily prepared if you have leftover White cooked chicken, then you only have to cook the kai lan and assemble the dish. Assemble the dish by alternating slices of chicken and ham. 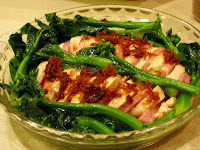 Prepare kai lan and decorate it around the chicken and ham. Heat saucepan or wok and pour in the chicken stock. When stock comes to a boil, drizzle in the cornstarch/tapioca starch mixture and bring back mixture to the boil. Pour sauce over the assembled dish. Top with XO sauce and drizzle with sesame oil.